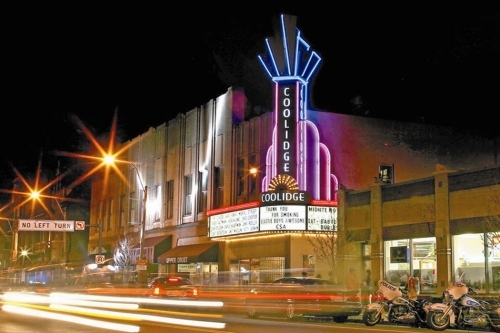 The Coolidge Corner Theatre located in the heart of Brookline. MBTA bus lines such as the 57, the 66, and 60 run through Brookline as well. The Country Club, an exclusive sporting club in the town, was the first private club in the United States formed exclusively for outdoor activities. It is most famous as a golf club. Coolidge Corner, located at the crossing of Beacon Street and Harvard Street, is one of Brookline's two primary retail districts (the other being Brookline Village). It includes a number of historically significant sites, including the S.S. Pierce Building (now occupied by a Walgreens), and the Coolidge Corner Theatre. The Puppet Showplace Theatre, located in Brookline village, is one of the four oldest puppet theatres in the United States.